Like I said in my goals post, I’m focusing on my collection of graphic novels and middle grade this month – the things I’ve bought but never got around to reading, so that is the vast majority of this week’s reading pile. I also read the only Manga on my shelf and a romance that held me over the day I forgot my physical copy – hooray iphone kindle app. I wouldn’t call that a bad word-count for 5 days worth of writing (th-f of last week, m, w-th this week). I wound up working on more than just the first priority ms this week, but I’m okay with that. My goal is constant progress, and I managed to get that. One million words…. is a lot. To be honest, when I set the goal at the beginning of 2013, I didn’t think I was going to make it. Even in a normal year, I couldn’t count on adding words in December, or even most of November. The end of the year always turns me into that crazy person at the zoo, you know, the one you think is on the wrong side of the bars. 2013 was special, one of my best friends got married! And that meant a few trips to Oregon, and that the month of August was going to lose most of my writing time. So I set out to write one million words in a year, fully accepting the fact that I might (and probably would) fail. But! I am a super organized person (as long as that organization is with the use of a spreadsheet)! and so, I set about figuring out how I would do it if I could. I figured out how many actual writing days I’d have (192), and how that all sorted out amongst the months…. So! Last year I set down some goals, and while I didn’t get all of them met, I’m pretty proud of what I did do. Managed not to go postal on anyone. The only thing I didn’t get done, was the crazy amounts of revisions I wanted to (and that stack has only gotten higher! Goals! I love goals. 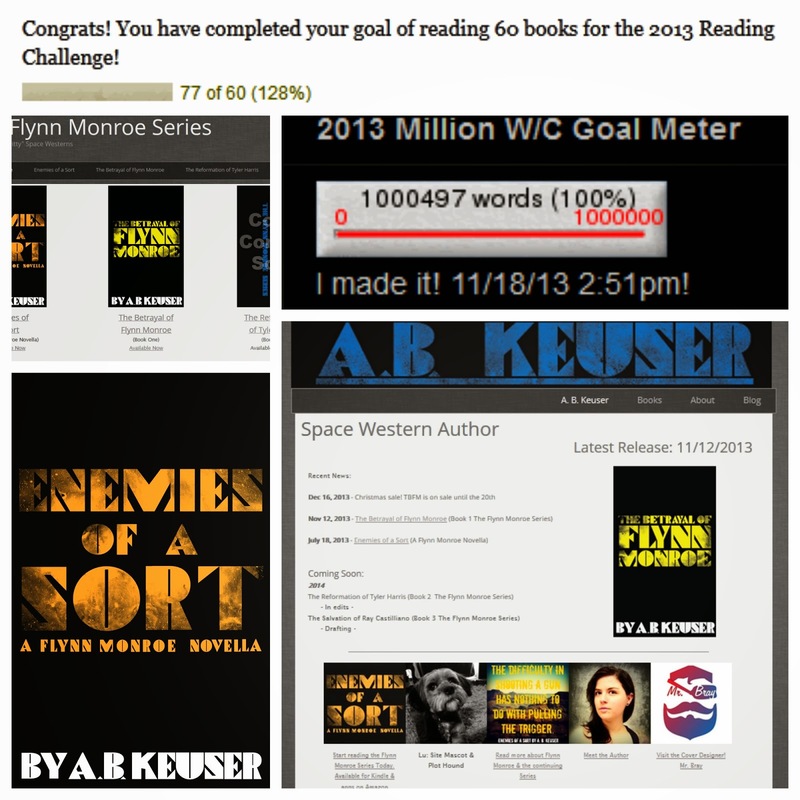 I thrive on goals (see 1-million words last year), so it’s no surprise that I have a few for this year too!